The venerable Jeep Wrangler has not changed a whole lot over the years. Despite the model being somewhat of a dinosaur in this new crossover era, the 2011 Wrangler had the model’s best ever sales in July 2011, selling 14,355 units. That is the Wrangler’s best month in Jeep’s 70-year history and it is on track to surpass 150,000 sales in the 2011 calendar year. One important change Jeep did make in recent years was adding a four-door Wrangler Unlimited back in 2004. This Wrangler Unlimited now accounts for about 60 percent of the model’s sales, without significantly diminishing its legendary off-road ability. The four-door has seating for five adults and has nearly three times the cargo space of the standard two-door Wrangler behind the rear seat. The 2011 Wrangler offers a new interior with upgraded materials, a redesigned instrument panel, and new storage areas. Heated seats, heated power mirrors, a larger rear window, new steering wheel controls, and automatic climate control were also added. Paint color options in the 2011 Wrangler include Deep Cherry Red, Sahara Tan, Detonator Yellow, Bright White, and Cosmos Blue. Fiat-Chrsyler, which owns Jeep, is looking to build onto the model’s sales momentum as the 2012 Jeep Wrangler has big changes under the hood. The model will get its own version of the Pentastar V6 already found in other Chrysler products such as the Dodge Durango and Jeep Grand Cherokee. In the 2012 Wrangler, the 3.6-liter Pentastar V6 produces 285 horsepower and offers a five-speed automatic transmission. This is an 83 horsepower improvement from the 2011 model and the engine’s displacement shrinks in size. The 2011 model uses an antiquated 3.8-liter V6 that has been in the model since 2007, inefficiently producing just 202 horsepower. The 2012 Wrangler has 40 percent more horsepower and 10 percent more torque than the 2011 model. Impressively, the new aluminum-block engine weights 33 pounds less than the outgoing one. This should help improve fuel economy. Expect the 2012 Wrangler to have a 0-60 time of about 8.5 seconds. Towing capacity also improves for the 2012 Wrangler. The two-door Wrangler with the new V6 will have a 2,000-pound capacity while four-door trims will have a 3,500-pound limit. 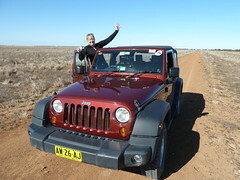 If you don’t own one, the Wrangler soft-top makes for a great rental vehicle. With the open air, views, the model’s vibrant paint colors, and higher driving position, it can make traveling a lot of fun. Although don’t expect to exceed 20mpg highway. I’ve been reading about the new Wrangler from the Royal Gate Automotive page and this new engine sounds really great. Good for 70 more years of Jeep! Well after owning Jeeps for 20 years and currently owning a new Caravan all I can say is why did Dodge not put a real 4X4 drivetrain in this Jeep? 3500 lbs towing is a real indicator of how well designed it is funny how all other 4 door SUVs can do 5000 lbs. We will see if the new Wrangler can equal the FJ Cruiser for reliability??? I will be able to report back after my FJC hits 200,000 and keeps chugging. I just can’t see how an engine made in Mexico is going to match one made in Japan.